Talbots Makeover – You’ve Come A Long Way Baby! 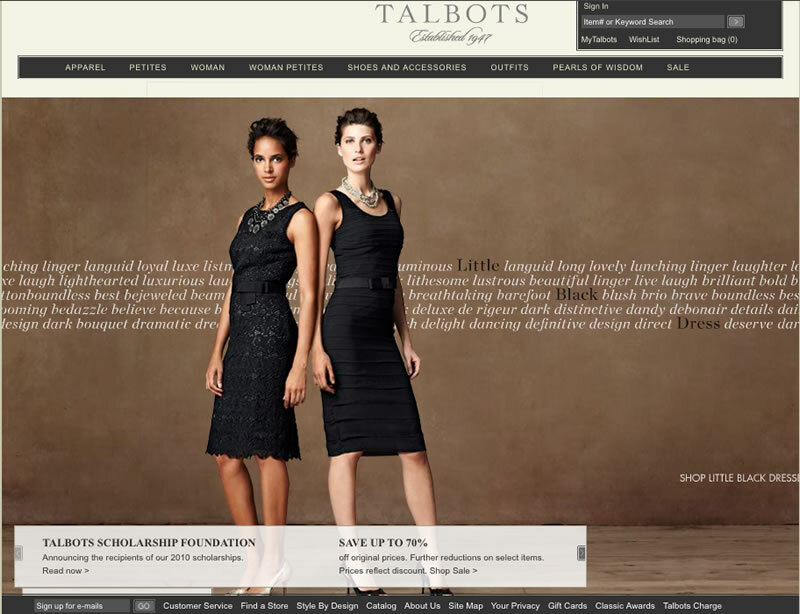 Talbots is not you’re grandmother’s store any more. This savvy retailer is boldly moving their 63 year-old company ahead on the fashion 2.0 landscape with an updated, e-commerce website, engaging Facebook page and Twitter account. In addition, Talbots Inc. is now a favorite on Wall Street, thanks to cost cuts and a complex financial arrangement for unloading its enormous debt. 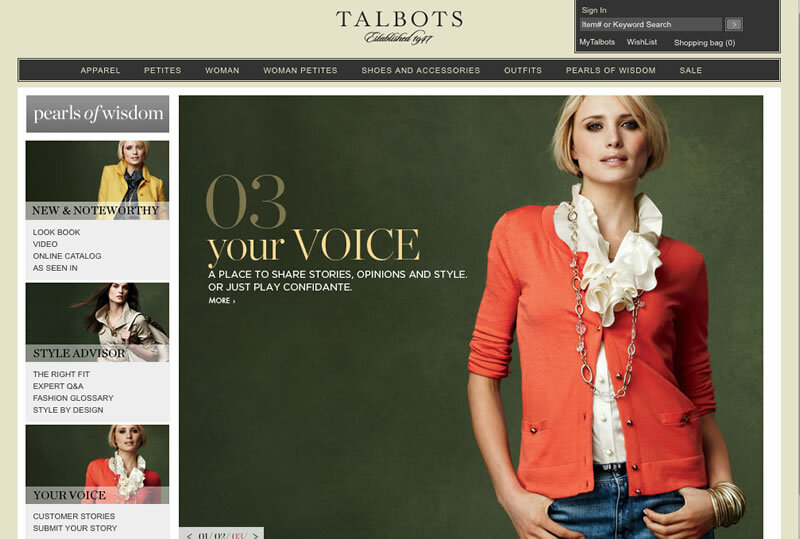 To solidify its comeback and boost sales, Talbots must complete a merchandise and image makeover that targets younger customers. Rejuvenating a brand that many women think of as perfect for their grandmothers is complicated. Talbots must make its clothes more youthful without alienating its core customers during the transition as well as persuade a new segment of women in their 30s and 40s to consider shopping there. Trudy Sullivan, Talbots chief executive, is attempting to refocus on women 35 and older. She joined the company Fall 2007 and has introduced some younger items, including slim jackets and feminine dresses. With Sullivan’s help, Talbots is aiming to make their fashions more hip with looks that include a sequin-trimmed sweater and leopard-print-lined black booties. So far, they have had some hits and some misses. For example, last spring, “ethnic” prints in bright colors including orange and lime green did not work for them. But this fall, a “pant fit initiative” gives customers a $5 gift card for trying on a pair from the new pants styles. The retailer sold 590,000 pairs in nine weeks. 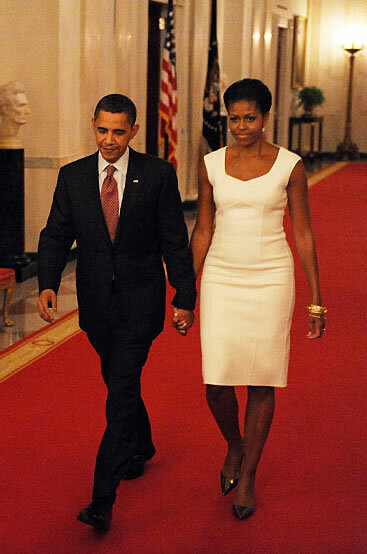 In addition, First Lady Michelle Obama has been spotted numerous times in Talbots clothing. Judging by the comments to a WSJ article this year in April about the Talbots image makeover, some of the core customers are not happy with the changes. Fortunately there were also those that embraced the change, “Classic can mean timeless, not just dowdy and that, I think, is what Talbots is trying to do.” It’s a catch-22 situation. “Talbots not only needs to get its core customer spending more, it also needs to get a new customer,” said Roxanne Meyer, executive director of specialty retail at UBS Investment Research. Only time will tell. Talbots refocused on women 35 and older, persuading a new segment of women in their 30’s and 40’s to consider shopping there and making their clothes more youthful without alienating their core customers during the transition. The Talbot website has an engaging, interactive section, “Pearls of Wisdom,” that is powered by the Bazaarvoice social commerce platform. According to the company, “Pearls of Wisdom: Your Voice” provides Talbots customers with a place to share their stories, opinions, and style. They are encouraged to address topics close to their hearts, including summer reading lists, embarrassing moments with moms and their absolute worst Valentine’s Day gifts. 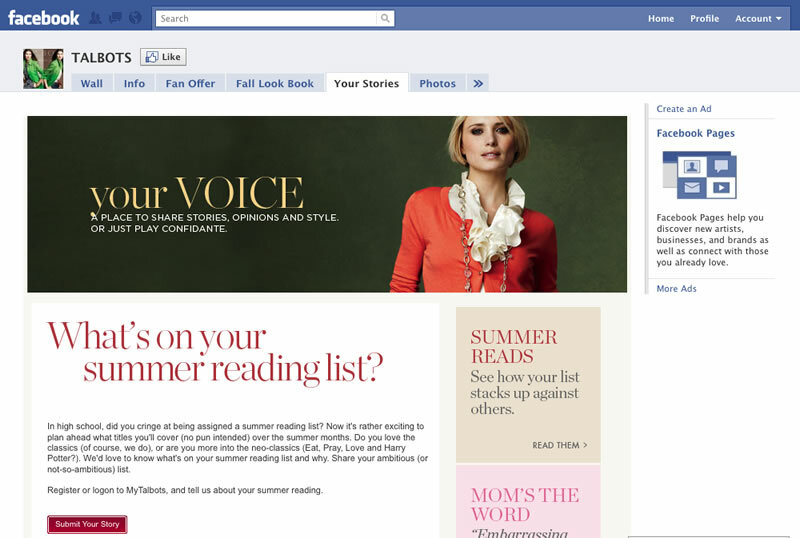 Topics are promoted by email and Facebook. 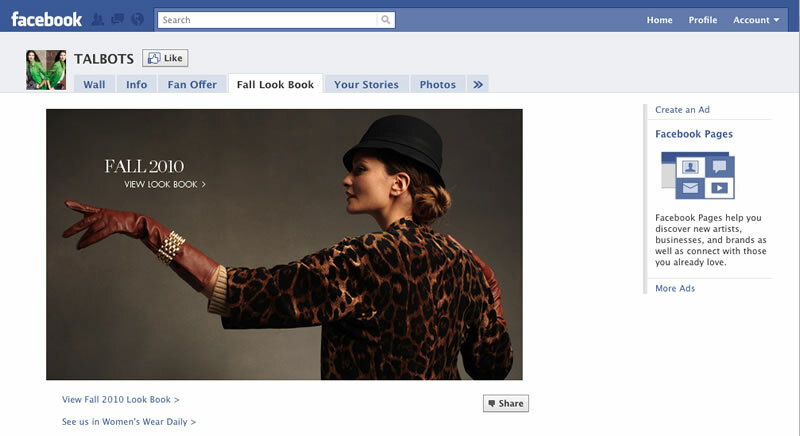 Top stories and writers are highlighted on Talbots Facebook fan page. On the Talbots Facebook page, there is also an interactive Look Book, link to an article in WWD about Talbots, exclusive offers for fans and a link to find a store near you. The “pant fit initiative” gives customers a $5 gift card for trying on a pair from the new pants styles. The retailer sold 590,000 pairs in nine weeks. 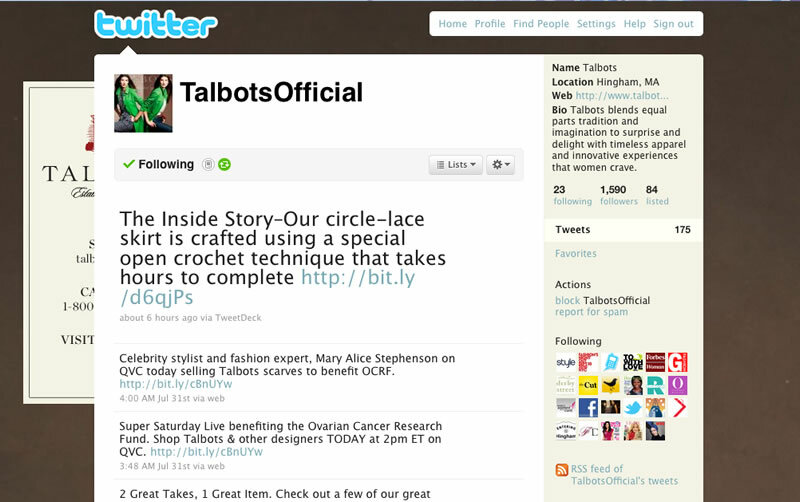 Promoting “Pearl of Wisdom” topics by email, tweets promote what is going on at Talbots and an opportunity to sign-up for email notification about special offers are other ways that Talbots is using social media marketing. Talbots was known as the label for suburban moms. Now, with the repositioning, “Talbots blends equal parts tradition and imagination to surprise and delight with timeless apparel and innovative experiences that women crave.” I love the new look and their fashion 2.0 achievements. Creating “Pearls of Wisdom” and promoting it through email and on Facebook is definitely an innovative tactic. However, Talbots still has work to do. For example, why not include the Facebook and Twitter icons on the website as well as add a YouTube channel featuring runway videos? These minor adjustments will expand their reach even further among younger women and ultimately take Talbots to the next level of fashion and retail success. This entry was posted on August 6, 2010 by Barbara Elizabeth. It was filed under Fashion & Social Media Marketing, Fashion On The Web, Social Media Marketing and was tagged with digital marketing, e-commerce, Fashion 2.0, fashion e-commerce, fashion marketing online, Fashion on the Internet, fashion on the web, internet marketing, online fashion, online fashion marketing, social fashion, Social Media Marketing, social media marketing in fashion, social media marketing in fashion industry, women's fashions.